Praksa is an engineering cooperative for design, urbanism and architecture. As socio-economic association Praksa employs direct democracy regarding all activities, including collaborative work projects. Solidarity, mutual help, integration of cultural and political engagement in the sphere of production, education, exchange of knowledge and skills are some of the cooperative’s guiding principles. Praksa was founded by members of Pulska Grupa in May 2011 as the first engineering cooperative in Croatia. It has members with several years of experience working in domain of architecture, photography, design and journalism. Kada opisujemo grad, služimo se nizom ustaljenih termina kojima se pozivamo na njegove određene dijelove ili funkcije: govorimo o centru i periferiji, o starim jegrama, poslovnim zonama, turističkim dijelovima grada, kvartovima... Iako su oni svakako korisni za lakšu komunikaciju (u više smislova), oni izostavljaju ili čak zaobilaze jedan njegov značenjski sloj, onaj koji je Barthesa naveo da o gradu govori kao jeziku, pisanju i pjesmi. Ti nas pojmovi navode da o gradu i njegovim pojedinim sastavnim dijelovima razmišljamo kao o živima, i to ne samo na način promjenjivosti označenika, već na način da je upravo međusobna interakcija društva ona koja ga stvara – on je mjesto susreta i s njime smo u neprestanom dijalogu. Iz tog je razloga svaki stanovnik grada neka vrsta čitatelja koji, ovisno o vlastitom kretanju, hvata određene iskaze i u mogućnosti je iznijeti barem osoban narativ. Jedan takav narativ možemo vidjeti na izložbi umjetnice Olje Stipanović - "matter in a wrong place”, koja okuplja niz crteža, kolaža i fotografija te jedan video, a kojima je zajedničko polazište komad urbanog mobilijara koji se koristio prilikom sezonskog čišćenja za isprašivanje tepiha. Riječ je o predmetu koji, još i u vrijeme kada se aktivno koristio, nije imao jednoznačnu funkciju, budući da je nekima bio simbol napornog rada, dok je drugima, onim mlađima, bio mjesto igre i okupljanja. Promjenom društvenih navika predmet je izgubio oba svoja sadržaja (iako ponegdje nailazi na nove, makar privremene, funkcije, kao npr. odlagalište za bicikle). Ovako izvučen iz konteksta on postaje gotovo neodgonetljiv, biva ispražnjen od svojih prethodnih značenja, a istovremeno iskrsava kao snažan simbol društvenih i urbanih promjena. Ono što ga čini tako snažnim simbolom je upravo njegova nefunkcionalnost, odsutna prisutnost koja gotovo da samo iščekuje novi sadržaj. When we describe the city, we use an assortment of standard terminology meant to recall its sections and purposes. We talk about its center and periphery, about the historic foundation, business zones, tourist attractions, and neighborhoods…. Although these terms are useful to streamline communication they omit or even eliminate a layer of meaning, the same layer that prompted Barthes to write about the city as language, writing, or poem - words which make us think of the city as of a living being, - not only in terms of shifting signifiers but as evidence of the community interaction being the maker of the city. The city is a place of meeting and we are in constant dialogue with it. This makes every city inhabitant a reader who, based on his/her daily movement registers images and is able to form at least a personal narrative. One such narrative is created in “matter in a wrong place” an exhibition by Olja Stipanovic. Consisting of drawings, collages, found objects and a video work. The common point of origin for the artwork is a piece of urban inventory used for seasonal cleaning –specifically for dusting heavy carpets. It is an object that even at the time when it was actively used had multiple functions, representing hard work for some and a place of play and gathering for others [younger ones]. As the social dynamics change, this object has completely lost both of these functions. It sometimes finds new ones as for example a bicycle rack. Abandoned and taken out of its context it becomes enigmatic and emptied of its earlier meanings. It than reappears as a strong symbol of urban and social change. What makes it a strong symbol is its non-functionality, its absent presence that seems to await and invite new content. Galerija MIroslav Kraljevic. Zagreb. Croatia. “A girl asks a monkey at the ZOO: Why do you live here? Isn’t it nicer where you come from?” This text opens Dušan Makavejev’s “Montenegro,” a film in which he shows the encounter of a wealthy American housewife, brought to Sweden by her businessman husband, with Yugoslav immigrants, who come to Sweden to look for work. The separation of the worlds, which leads the protagonist Montenegro (who gets a job at the ZOO) to his tragic end, is primarily class-based, but is also the product of a specific production of otherness, and his suicide is the final consequence of the clash between the imagined idea of the constructed “other” (the wild Balcan, attractive and intimidating at the same time) and his actual appearance – the man whose position is clearly determined by concrete economic and political processes, whose origins reveal nothing exotic, and whose workers’ nomadism contains nothing romantic. The exhibition Between Worlds II approaches the issue of migration in the contemporary economic and political moment from the position of the criticism of the production and use of images. In the video Postcards and the photo series Impressions: Landscapes/Paradise of Slovenia, the artist Nika Autor uses archival footage from Radio-Television Slovenia (RTV) in order to show “that the image by itself, determined by the mode of production (montage), implies the criminalization and victimization of asylum seekers, fugitives and migrants. (…) The mode of production establishes the optics of RTV’s gaze which reduces segregates, discriminates, excludes and constructs ‘the other’.” In the installation The Housing Question, the artists Rena Rädle and Vladan Jeremić present three specific cases of Roma deprivation, the Belgrade, the Roman and the Helsinki one, in order to put the so-called “Roma issue” in its right place, into class relations in the production of space. Through three videos they expose the image of Roma-nomads as a construct which conceals the fascistoid politics of cleansing the city of Roma, but they also relate such politics to the general tendency of “the market-oriented state to deny the lower class the right to the city,”offering different approaches to addressing the problem of migrant workers’ housing. Between Worlds II aims to draw attention to the issue of alleged mobility in the art field. Makavejev himself is in the position of the immigrant when he films “Montenegro” in Sweden, and the survey “How to suture a finger with a credit card and other stories” we include in the exhibition focuses on contemporary migrations of artists and cultural workers. Beyond the romanticized image of travelling artists and the supposed democratization of the art field, it represents a counter-image of the creative class as a reserve army of artists who, under the guise of the promise of the so-called global art, daily reproduce immigrant conditions. Emil Trutanić, Ksenija Turčić, Mirjana Vodopija, Tina Vukasović, Loren Živković Kuljiš, Gorki Žuvela i jedan anonimni umjetnik. Opening: Thursday, October 3rd 6.00 - 8.00 PM. between 11th and 11t Avenue. The newest site- specific installation by Olja Stipanović revolves around the fact that her exhibition takes place in a gallery of New York City’s Chelsea art district. Home to the most prestigious art spaces, the opportunity to exhibit at this particular location is widely considered the peak of an artist’s career. To “be” in Chelsea is for many an affirmation of accomplishment; an opportunity to be seen by many, to be praised by the professional audiences, and to possibly gain artistic as well as commercial success. The title of Stipanović’s exhibition, Summit, draws a parallel between man conquering nature and an artist seizing the art world. Inspired by mountain films, a film genre that has since the 1920s captured various climbing expeditions under challenging climate conditions and in harsh natural environments, the artist has constructed her own metaphorical mountain to ascent; the wall composition in pyramidal shape consisting of drawings, collages, objects and text. There is a lightheartedness and humor, but also critical analysis in the artist’s approach to the subject, asserting the contemplation on what really constitutes attainment today, in particular in the contemporary art world driven by multifarious ambitions and actions and often problematic notions of quality and value. Collages made of thorn paper render abstracted imagery of mountains; vintage photographs of mountain climbers and commercial ads featuring snowy hills are appropriated and transformed through scanning, printing, cutting and pasting. The artist inserts her own image in this bountiful composition. Her head is crowned with a laurel wreath, the symbol of victory present in depictions of emperors and artists since the ancient times, and surrounded by text excerpts, both formal and personal, describing the concepts of success and triumph. Summit also features some of Stipanović’s previously made works, as well as the images hinting to discipline, practice, rules of conduct and achievement, such as the obstacle course outline of an equestrian jumping field. The installation extends to the floor of the gallery, which is dominated by two wooden planks stretching from the entrance to the gallery windows. Formally, these sculptural elements recall minimalist sculpture, guiding the viewer’s movement and experience of the exhibition space. However, by leaning them against the windows, Stipanović brings out their physical instability as a metaphorical ambiguity; does a possible walking the plank of success implies reaching higher grounds, or falling? Najnovija site - specific instalacija Olje Stipanović inspirirana je činjenicom da se umjetničina izložba odvija u galeriji pozicioniranoj u njujorškoj umjetničkoj četvrti Chelsea. Chelsea je lokacija najprestižnijih komercijalnih umjetničkih galerija, a prilika za izložbu u jednoj od njih općenito se smatra vrhuncem umjetničke karijere. Biti izlagan na ovom mjestu za mnoge je veliko dostignuće; prilika da nečiji umjetnički rad bude viđen od velikog broja posjetitelja, hvaljen od strane profesionalne publike, te prilika za umjetnički kao i komercijalni uspjeh. Naziv Oljine izlozbe Vrhunac uspostavlja paralelu između čovjekovog osvajanja prirode i njenog individualnog osvajanja umjetničke scene. Potaknuta istraživanjem filmskog žanra Bergfilme, koji je još od 20-tih godina prošlog stoljeća zabilježio mnogobrojne planinarske ekspedicije u izazovnim klimatskim uvjetima i na surovim lokacijama, umjetnica je konstruirala svoju vlastitu metaforičku planinu za svladavanje, u obliku piramidalne kompozicije na zidu galerije, sastavljenu od crteža, kolaža, objekata i teksta. Oljin pristup tematici je zaigran i pun humora, no istovremeno otkriva umjetničin kritički stav i promišljanje o tome što zaista danas konstituira uspjeh, naročito u suvremenom umjetničkom svijetu koji diktiraju najrazličitije ambicije i akcije, te često problematične definicije kvalitete i vrijednosti. Kolaži načinjeni od iskidanog papira predstavljaju apstrahirane planinske krajolike; starinske fotografije planinara i reklamni oglasi sa snježnim brežuljcima preuzeti su da bi bili transformirani kroz skeniranje, printanje, redukciju i dodavanje novih elemenata. U ovu bogatu kompoziciju umjetnica je inkorporirala i svoj vlastiti lik, portretnu fotografiju na kojoj je ovjenčana lovorikama (simbolom pobjede prisutnim u prikazima vladara i umjetnika od antičkih vremena), okruženu personalnim i formalim tekstualnim definicijama uspjeha i trijumfa. U instalaciju Vrhunac također su uključeni neki od prijašnjih Oljinih radova, kao i motivi koji nastavljaju aludirati na disciplinu, vježbu, pravila ponašanja i uspješnost, kao na primjer skica prepreka sa konjičke utrke s preponama. Instalacija se proširuje na pod galerije, kojim dominiraju dvije drvene daske koje se protežu od ulaza u galeriju sve do prozora. Formalno, ovi skulpturalni elementi podsjećaju na minimalističku skulpturu koja diktira kretanje posjetitelja i utječe na doživljaj samog izlagačkog prostora. Međutim, naslanjanjem dasaka na okvire prozora, Olja koristi njihovu fizičku nestabilnost kao višeznačnu metaforu; da li moguće hodanje po njima, ususret uspjehu, podrazumijeva dosizanje viših ciljeva, ili pad? Ulica Augusta Senoe 11, Zagreb. Croatia. Window International je zajednički migracijski format. Promjenjiv i obeshrabrujući pogled na svijet kroz avionski prozorčić. [pomalo] novi početak. Više od dvadeset godina živim u Queensu u New Yorku. S vremenom sam počela shvaćati Queens kao svojevrsni produžetak zrakoplovnih terminala zračne luke JFK, kao mjesto neprestanog Völkerwanderung-a. ”Terminal City” koji su gradski oci, urbanisti i arhitekti pedesetih, šezdesetih i sedamdesetih planirali kao viziju globalne budućnosti gotovo da je nestao u vrijeme kada sam po prvi put tamo pristigla 1992. godine. Vizionarski međunarodni terminali Zračnih luka Queensa danas su puni sveprisutnih službi sigurnosti i provizornih, bezličnih konstrukcija prekrivenih reklamama, a letenje se pretvorilo u proces koji se mora izdržati i od kojeg treba strahovati. Queens je grad koji se širi iz smjera Terminal Cityja. Na tom mjestu prostor grada postaje nemjesto[, društvene se konfiguracije mijenjaju jednakom brzinom kao brojke koje označavaju mjesta ukrcavanja na let, a stranci postaju domaće stanovništvo. Nigdje drugdje na svijetu nisam vidjela toliko prometa, toliko propuha i toliko budućnosti kao što sam to vidjela u Queensu. Ako pogledate gore, iznad glave će vam uvijek biti nekoliko zrakoplova sa svojim prozorčićima s kojih sipi nesigurnost i životne zagonetke. S migracijom sam bila u kontaktu svaki dan, svaki tjedan i svaki mjesec koji sam živjela u Queensu. Čula sam o bezbrojnim razočarenjima, planovima, očekivanjima i projekcijama. Tamo su gotovo svi samo privremeno, istjerani s nekog groznom i nepovratnog mjesta, pristigli ili u prolazu prema nekom boljem mjestu ili, napokon, svome domu. Ponekad je potreban čitav život. Postaje čitav život. Slobodno pridodajte svoj pogled ili spustite roletu. societies in which, at least in certain segments of life, time has not stood still. any more, and after we / they thought that the transition has been completed, it turns out that the intitation is yet to begin. From the time of the Internet, the idea of community has evolved to a different meaning of the original word, but there is still a need to bring back or maintain the sense of community where people engage in human interaction. In this show we invite artist to explore with their own creative process the meaning of community, whether is working together or alone, using technology or not, the artist is invited to experiment with the original meaning of community and engage the public to reflect on their own. The exhibition will celebrate and capture the talent, creativity and spirit of LIC artists in a show that explores the significance of collaboration, social interaction and the sense of community. The exhibition will showcase the diversity of all visual arts media (2D, 3D, Video/Installation and performance artists). 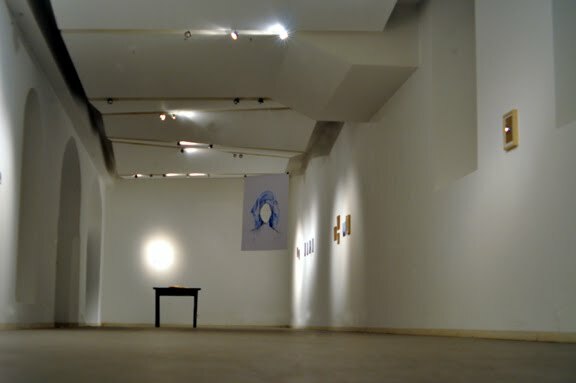 The second exhibition space is The Secret Theatre Gallery located at the entrance lobby of the theatre as a satellite project gallery for the exhibition. Grizzly Grizzly is pleased to present our inaugural call for entries, ‘Other Possible Titles,’ a survey of contemporary art juried by the members of the collective. The thirty-five artworks selected -- culled from nearly 250 submissions -- represent the wide range of artistic strength and thoughtfulness we witnessed from our artistic peers throughout the process. By far our largest exhibition to date, ‘Other Possible Titles’ will utilize the entirely of the gallery and spill out into the adjoining floor. Although incredibly divergent in media, the work on a whole demonstrates a particular intelligence and awareness of material and play within contemporary practices – whether it be through installation, photography, sculpture, video, or painting and drawing. Selected artist locations range from Philadelphia to New York, Ypsilanti to Los Angeles, Barcelona to Ireland. Throughout the duration of the exhibition, Grizzly Grizzly will encourage visitors to vote on their favorite work. The artist receiving the most votes will receive a solo exhibition in the 2012 gallery season. Grizzly Grizzly is a project space in Philadelphia, PA. Since 2009, Grizzly Grizzly has programmed monthly exhibitions, screenings and performances. The gallery is currently under the direction of artists Mike Ellyson, Jacque Liu, Dennis Matthews, Matthew Price, Ruth Scott, Mary Smull, Cindy Stockton-Moore and Josh Weiss. Materials derived from natural resources tend to have an ephemeral state; at times a presence in which allows one to reflect over the ever-fleeting moments of existence. For centuries, many cultures have been incorporating raw materials into various art forms as opposed to man-made or synthetic materials. We were first introduced to a shift in material usage through the Post Minimalist and Process Art era where the actual process of art was the principal focus not the end product. Raw Substance is a group exhibition consisting of artists who explore “non-traditional” materials through alternative processes. This exhibition will takea closer look at raw materials such as organics, resin, encaustics, textiles, handmade biodegradable paper to light photography. Furthermore, this exhibition will focus on artists who continually investigate and push the boundaries of medium specificity. At times these materials require labor-intensive techniques that can be unfortunately lost in visual translation when exhibited through a subjective or thematic trajectory. Preservation and sustainability have also become of a greater challenge for artists and conservators alike. Raw Substance will highlight artists who consider the effects of time, perishability and deteriorating effects as an important criterion of their artistic expression. opening reception: Friday September 30, at 7 PM. Unsettled and inspired by actual situations, my work consists of collages, texts, objects and spatial interventions which employ visual gestures of testing, contempt, and refusal to play by the rules in order to resist the norms and indoctrinations I am now hurdled with on my own terrain. It explores movement through space as I now experience it. This work, made in and marked by the years since my child’s birth, focuses on what happens to people when they are confronted with „mothering‟ in contemporary, urban, transient, non-spaces ruled by mobility - where it actually happens - as opposed to domestic, intimate spaces where they usually imagine raising children takes place. My artistic method is based in conceptual practice and uses analytical, straightforward resources. It is now shaped by my resentment for the impossibility, the abyss between being a mother and functioning well as an artist. The lithographs, photo based collages, cut outs, and drawings I am currently working on contain the source and are the starting point of the exhibition. The space of the gallery plays a very important role in how this work is installed and presented. The paper based work is fragmentary, interrupted and additionally developed by and in the space. Sometimes to focus and clarify an idea and sometimes to offer even more questions. Paper based work extends into the space and often grows into setups and installations as found objects surface and materialize based on it. Connections and interruptions between works become new pieces. The exhibition develops in the space between the images, the objects and the space they inhabit. Manhattan Graphics Center Summer residency grant. Olja Stipanović dobitnica je eminentne stipendije “Manhattan Graphics Center” u New Yorku. Kao dobitnica ljetne umjetničke rezidencije od svibnja do kolovoza 2011., Olja Stipanović imati će priliku stvarati unutar “Manhattan Graphics Center” studijskog prostora, koji objedinjuje udruženje umjetnika, galeriju, i grafičku radionicu posvećenu promoviranju grafičkih likovnih tehnika. “Manhattan Graphics Center“ je smjesten u West Villageu gdje sa svojim strucnim kadrom nudi potporu umjetnicima u stvaranju visoko kvalitetnih radova u svim grafičkim tehnikama. Olja Stipanović rodena je 1975. u Puli. U svojem suvremenom likovnom izricaju koristi različite medije: fotografiju, zvucne instalacije, crtez i kolaz. Diplomirala je 1998. na uglednom sveucilistu “Parsons School of Design – Odsjek likovnih umjetnosti” , gdje je i magistrirala 2000. Dobitnica je brojnih stipendija, nagrada i gostovanja [U.S. Embassy Cultural Grant Zagreb, Croatia, 2004, Institute for Electronic Arts artist in residence - Alfred University, 2005., Art Materijal” stipendija Hrvatskog Instituta za suvremenu umjetnost, 2004, Independent Artist Initiative Grant from - QCA, 2007]. Kao gošća umjetnica, umjetnička savjetnica i predavačica od 2000. godine Olja Stipanović sudjeluje u mnogim umjetnickim programima u Hrvatskoj i SAD-u. Njeni su radovi izlagani na samostalnim i skupnim izložbama. Participating artists : Anna Furse featuring Marie-Gabrielle Rotie, Anne Bean in collaboration with Poshya Kakl, Vlasta Delimar, Efi Ben-David & Sinead O’Donnell (PAVES), Curious, Deepa Craig, Elena Skoko, Emma Hart, Emma Katherine Skeldon, Gina Czarnecki, Ivana Peranić, Ivana Nataša Turković, Julijana Kocanović Grubić, Kira O'Reilly, Lara Ritoša Roberts & PKF, Lisa Flynn, Lucy Cash, Lydia Maria Julien, Megumi Eda, Nataša Stanić/Erika Cuk & SDNA, Nela Milić, Nhandan Chirco, Nikolina Nikoleski, Olja Stipanović, Oriana Fox, Piglet & Butcher Boy, Polona Dolžan, Rebecca Feiner, Sanna Kuittinen, Silvia Pavone, Sonia Boyce & Ain Bailey, Sophie Kasser & Moveo, Stacy Makishi, Susanne Ohmann, Valentina Lacmanovic, Verónica Pérez Karleson, Virginia García Ramos and Zory Shahrokhi. Slet 080311 is conceived as an international digital festival of works by female artists who use their own body as an expressive tool or are exploring a concept of the body / identity through image and movement. Featuring eclectic footage – from live & performance art, through circus and dance, to photography and video - Slet 080311 is a versatile collection of works created by both emerging and established contemporary artists. 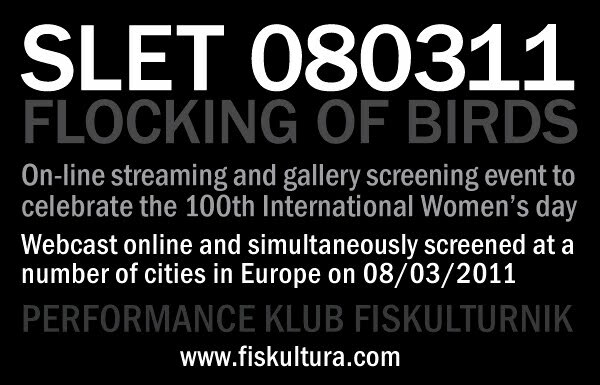 The footage will be webcast on-line at fiskultura.com and simultaneously screened, at a number of cities in Europe on the 8th of March 2011 - the 100th International Women’s day. Conceptualising each artist as a cell, equally essential in the construction of this collective digital body, the participants connect into a creative mass that celebrates and commemorates the history of female suffrage, feminist movements and universal themes around female identity . All in all– a true flocking of ‘birds’! Participating artists : Anna Furse featuring Marie-Gabrielle Rottie, Anne Bean in collaboration with Poshya Kakl, Vlasta Delimar, Efi Ben-David & Sinead O’Donnell (PAVES), Curious, Deepa Craig, Elena Skoko, Emma Hart, Emma Katherine Skeldon, Gina Czarnecki, Ivana Peranić, Ivana Nataša Turković, Julijana Kocanović Grubić, Kira O'Reilly, Lara Ritoša Roberts & PKF, Lisa Flynn, Lucy Cash, Lydia Maria Julien, Megumi Eda, Nataša Stanić/Erika Cuk & SDNA, Nela Milić, Nhandan Chirco, Nikolina Nikoleski, Olja Stipanović, Oriana Fox, Piglet & Butcher Boy, Polona Dolžan, Rebecca Feiner, Sanna Kuittinen, Silvia Pavone, Sonia Boyce & Ain Bailey, Sophie Kasser & Moveo, Stacy Makishi, Susanne Ohmann, Valentina Lacmanovic, Verónica Pérez Karleson, Virginia García Ramos and Zory Shahrokhi. The event is conceived and curated by Lara Ritosa Roberts, produced by PERFORMANCE KLUB FISKULTURNIK with the financial support of the Istrian Department of Culture (ISTARSKA ŽUPANIJA – REGIONE ISTRIANA / UPRAVNI ODJEL ZA KULTURU – ASSESSORATO ALLA CULTURA) & Performance Klub Fiskulturnik members. ARTISTS: Amy Bay, Elizabeth Cohen, Erika deVries, Lalie Douglas, E. Ashley Fox, Masha Godovannaya, John LaMacchia, Shelly Low, Maja Malbon, Caitlin Masley, Alison Mercer, Joomee Paik, Kristen Palazzo, Zhenya Plechkina and Misha Sklar / VYDAVY SINDIKAT Maja Rakočević - Cvijanov, Maja Radešić, Elena Skoko / BLUEBIRD AND SKOKO, Ivan Stojaković, and Dina Weiss. Etymology: (from Latin cura, care), cura -ae f. [care]; (1) [care taken, carefulness, pains, attention, minding of things or persons]; of business, [management, administration]; [an object of care, or a guardian, caretaker]. (2) [care felt, anxiety, worry, disquiet]. : one who has the care and superintendence of something; especially : one in charge of a museum, zoo, or other place of exhibit: Law. a guardian of a minor, disabled, or similar, esp. with regard to his or her property. CURATORS [raising humans] is a group show featuring artists connected by a particular understanding of time and space. They are all curators. In the original Latin sense of the word - they are the curators of aches and pains, meals and playtimes, first steps and first words. They cure disappointment, scrapped knees, and all kinds of hunger. They are the caretakers of educational and developmental objects. They choose the right shoes and what is good for spine development, the amount of color, light, and music. To put it bluntly – these artists are parents. 2 years ago, my son was born. He took over my body, my thoughts, and my life. As we gradually and difficulty started to unravel and take on our new [separate?] lives as Mother and Child, I began to realize that I too, am now a curator ….or I need to be it more diligently. Take care of a non-working thyroid, find niches and time slots for what I want to do and what I dream about doing, rearrange living space to have a room [a hallway with a desk] of my own. CURATORS came about at the most complicated time for me. It happened out of need to find new references and out of great happiness upon discovering a whole new world of artist who enjoy and cherish what they do in the most zealous way. The installations, drawings, paintings, embroideries, photographs, performances, texts, screenings and objects I included in this exhibition are all “naptime productions”, works that came into being as these artists were becoming parents. Most of these works were realized [or are yet to be] in a time crunch, on a kitchen desk, while not alone, in between laundry drop off and a daycare pick up. They speak of frustrations, self-doubt, confrontations with prejudices, and questions about the necessity and feasibility of making art. These works examine the myths of artists’ [mothers’] ability to create, to shape and sustain a narrative. Through the works in this show, you can detect a peculiar sardonic thread, an obvious fascination with all sorts of refuse, and a time anxiety similar to the one found with a certain white rabbit. Because these artists consciously set the highest of parentally expectations without even blinking, [that of raising socially responsible and at the same time happy human beings], you will also uncover a passionate and wild love we have for both family and work – the kind that is rooted in a profound and altruistic sense of humanity. Buzzer Thirty Art Space promotes experimentation, revision, demystification, growth, enthusiasm and concern. It organizes, and hosts art exhibitions, readings, teacher-education seminars, lectures, film talks, and writing, art and media classes with the support and guidance of local educators, artists, and theorists. Vijeće Galerije VN u sastavu Jasna Jakšić, Daniel Kovač, Ines Krasić, Olga Majcen Linn, Sunčica Ostoić i Sabina Sabolović izabralo je sljedeće projekte za izlaganje u 2011. godini. Izlozba Olje Stipanovic POSTPARTUM AFTERPARTY otvoriti ce se 7.07 2010 u 20.00 sati u galeriji Aneks, Istarska 30, 52100 Pula. Izlozeni ce biti recentni radovi nastali 2009/10 godine. Na zamolbu umjetnice, Artist Statement/ Press release bit ice vam dostupni jedino u galeriji ili. e-mailom nakon otvorenja izlozbe. Anex Gallery is pleased to announce Olja Stipanovic's second solo exhibition - POSTPARTUM AFTERPARTY, opening Wednesday, July 7th 2010 at 20.00. A press release will be avilable at the opening or after the opening by e-mail request. Glocally Newark has combined forces with creative agency Tritonic and urban planning firm Newwork to form the 239 Collective. This innovative hub, located at 239 Washington Street, will act as a gallery space for up-and-coming artists to come together and express themselves. The 239 Collective’s first exhibition titled “Collect This” will kick off on June 24, 2010 along with the launch of the, IM Newark Campaign. "Collect This" is an assemblage of works that represent the ideas and boldness of the New Newark. The event will bring together unique works from local artists such as Daniel Brophy, Marc D’Agusto, Ben Douglass, Ned Drew, T.F Dutchman, Samer Fouad, Jerry Gant, Matthew Gosser, Joshua Knoblick, Brenda Mcmanus, Mr. Mustart, Clarence Rich, Olja Stipanovic and more. umjetnici : Daniel Brophy, Marc D’Agusto, Ben Douglas, Ned Drew, T.F Dutchman, Samer Fouad, Jerry Gant, Matthew Gosser, Joshua Knoblick, Brenda Mcmanus, Mr. Mustart, Clarence Rich, Olja Stipanovic. grupna izložba COLLECT THIS održava se od 24. Lipnja do 27. kolovoza u galeriji 239 Collective koju su pokrenule Dizajn agencija Tritonic , GLocally Newark i urbanisticka agencija Newwork kao prostor za prezentaciju mladih “up-and-coming “ umjetnika. Među umjetnicima izbranim za prvu, inauguralnu izložbu ove nove galerije izlaže i Olja Stipanović iz Hrvatske.